When will be Extreme Cake Makers next episode air date? Is Extreme Cake Makers renewed or cancelled? Where to countdown Extreme Cake Makers air dates? Is Extreme Cake Makers worth watching? Welcome to the world of extreme cake making, where sugar craft specialists up and down the country dream up ever more elaborate ways to satisfy our sweet tooth. In London, cake maker Nastassja's pushing the boat out for her latest commission to celebrate little Noah's first birthday. Asked for a Noah's Ark themed cake, Nastassja's planning to position her revolving edible boat on a giant spurt of water made from 12 layers of vanilla sponge, topped with rice cereal and marshmallow waves. Molly's hoping to make a bit of a flutter as she creates a giant butterfly cake for a birthday surprise. Sculpted from vanilla sponge sandwiched with buttercream, she'll use all her sugar craft and air brushing skills to capture the insect's delicate and distinctive blue and pink markings in vibrant sugar paste. In Lancashire, Rosie's aiming to hit the jackpot with a working roulette table cake for a gala dinner. Taking five days to make, and built from chocolate orange cake, it comes complete with an edible life-like, highly detailed croupier! Penzance bakers Phil and Christine take on a very unusual commission as they make a cake to celebrate a friend's recovery from a broken ankle, and devise a leg shaped cake, complete with a removable plaster cast made from modelling chocolate. Michelle makes an edible work of art for her village's annual arts festival, in the form of a six-and-a-half-foot-tall lime tree cake, with 20 kilos of edible bark and hundreds of hand-coloured rice paper leaves. Nastassja tackles a four-and-a-half-foot-tall wedding cake, embellished with fondant flowers and edible lace, which must also include traditional kente fabric patterns in its design as nod to the happy couple's Ghanaian heritage. Molly tackles a tricky T-Rex fourth birthday cake for a dinosaur-crazy little boy's big day. Two-foot long and weighing in at 20 kilos, this prehistoric sponge comes complete with piercing eyes, pointy teeth, and a clutch of eggs wrapped as presents. Michelle takes on a commission close to home, as husband Michael asks her to make a technically challenging cake to celebrate the 20th anniversary of his IT company. In Shotton, former tattoo artist turned cake maker Ben's next cake requires military precision, as he tackles a 60th birthday caricature that must show the birthday boy dressed in his 'airsoft' game combat gear. But things don't go according to plan as Ben battles with stability issues due to his cake's oversized head! Ben must deliver a cake with real bite as he makes a shark's head as a surprise for a 60th birthday. Sculpted from vanilla and chocolate sponge, it comes with realistic eyes and a full set of pointy sugar paste teeth. Baking meets building for Lancashire based Molly, as she sculpts a cake replica of Queen Anne's Summer House to celebrate a construction company's 40th anniversary. Made from red velvet and Victoria sponge, Molly layers the cake like bricks as a special surprise when the cake is cut. Nastassja tackles an unconventional wedding centrepiece, with a three-foot tall, 60 kilo, modern wedding cake. Built from lemon, red velvet and vanilla cake, it's decorated in edible lace, black sugar crystals and fondant petals, but her hardest task is working out how to separate the heavy tiers using a lit and flower filled glass vase! 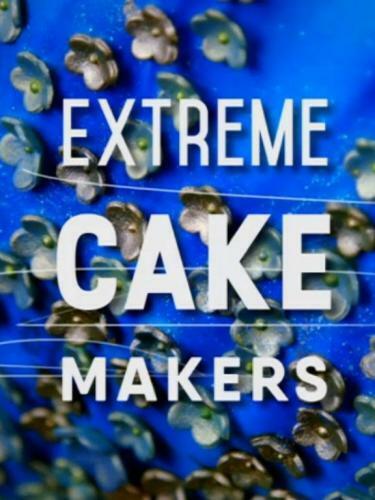 Extreme Cake Makers next episode air date provides TVMaze for you. EpisoDate.com is your TV show guide to Countdown Extreme Cake Makers Episode Air Dates and to stay in touch with Extreme Cake Makers next episode Air Date and your others favorite TV Shows. Add the shows you like to a "Watchlist" and let the site take it from there.